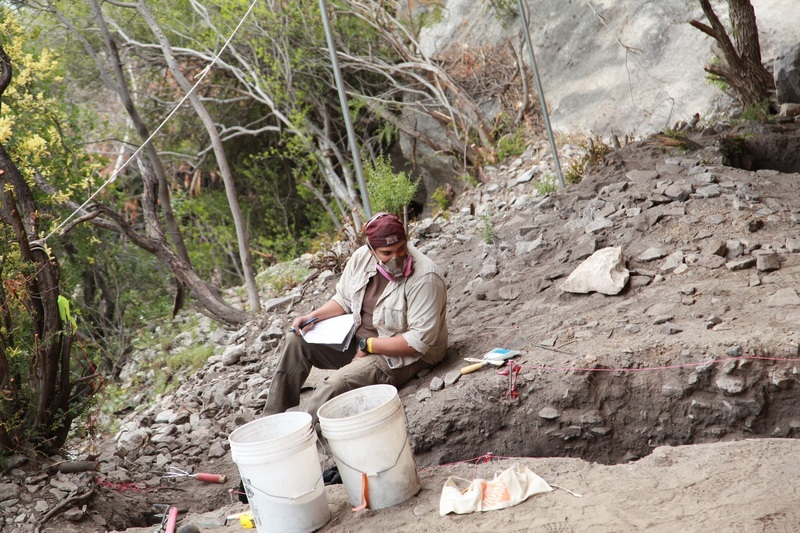 Eagle Cave has been the scene of previous archaeological investigation (e.g., E.B. Sayles and J. Charles Kelley as well as the Witte Museum in the 1930s followed by the work by the University of Texas in the 1960s). Looking at the surface of the shelter today, one of the first things people notice are the numerous unnatural depressions and mounds—vestiges of the decades of shelter excavation. In fact, upon our initial arrival at Eagle Cave this past winter one of the first things that caught my (Brooke’s) eye in regards to the shelter’s topography was a large sloping depression in essentially the center of the rockshelter, running from the back wall to the drip line. It is massive! If I stand at the lowest point I can’t see over the present ground surface! 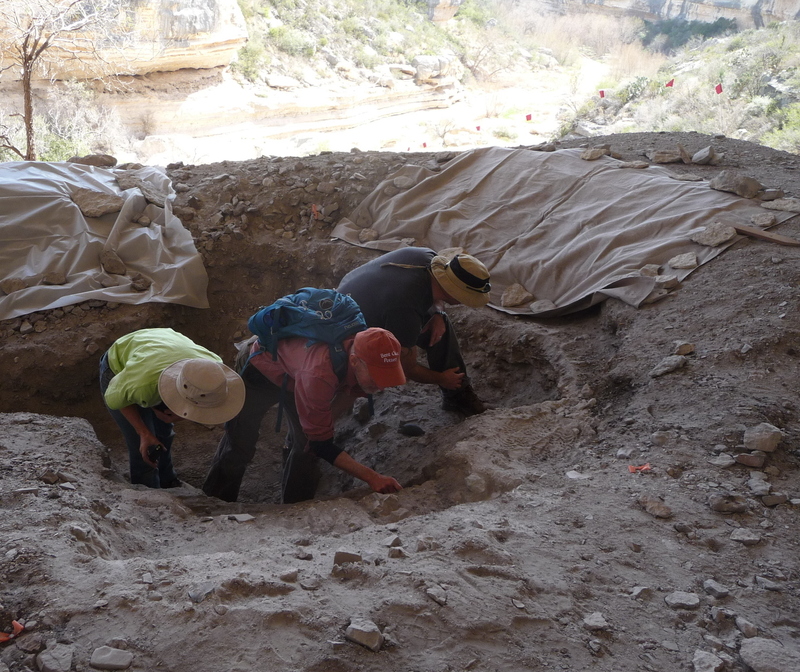 Now, several months later, it has become evident the modified landscape left behind by previous expeditions to Eagle Cave have created a challenge for our ongoing excavations in Eagle Cave: searching for intact deposits in their original context. Profile Section 2 (PS02) is located near the rear wall of Eagle Cave. The intact stratigraphy is visible as white bands in both photographs. 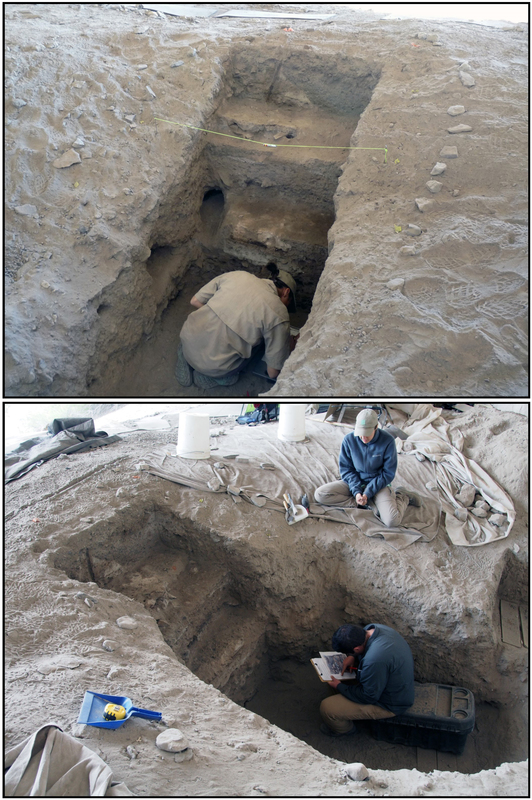 Where Brooke is sitting in the top photograph, and Jake in the bottom photograph, is the disturbed fill we had to remove before we exposed the intact stratigraphy. This fill is full of goat and sheep poop that has mixed in with the sediment when previous excavation trenches collapsed and filled in. Let’s take a pair of scissors for example. When found in association with crayons, glue, and paper, a pair of scissors could be described as used for crafts. 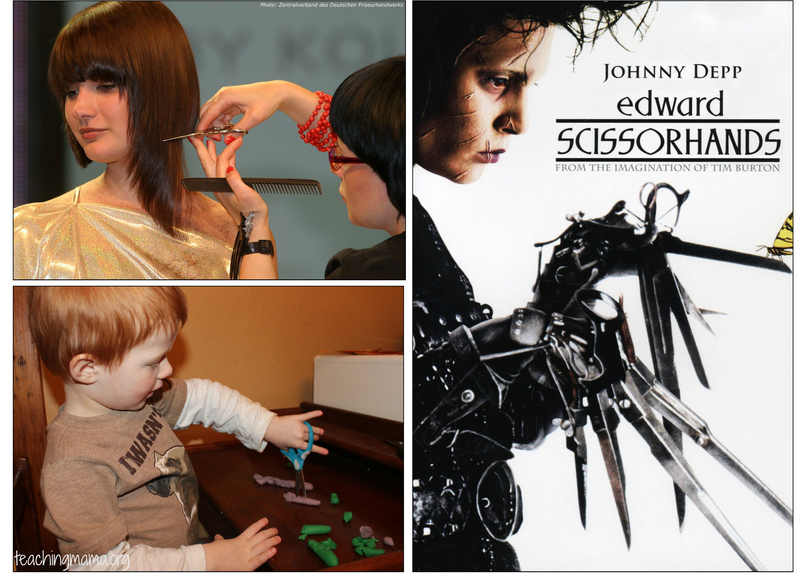 However, when the same pair of scissors is found in association with a comb, shampoo, and blow dryer, the scissors could be described as used for cutting/styling hair. Depending upon what an object is found in association with can completely change its interpreted use. The age of an artifact can also be determined by the other objects it is found in association with. 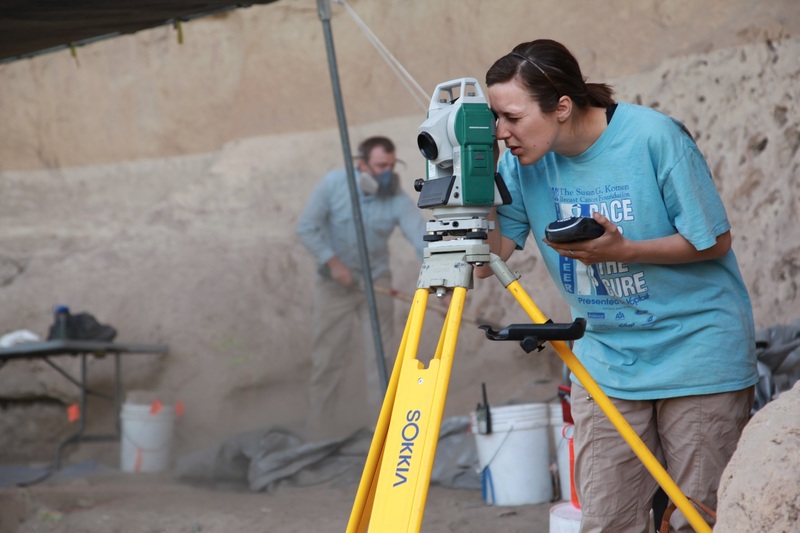 In essence, context is crucial to understanding an artifact’s function within an archaeological site. 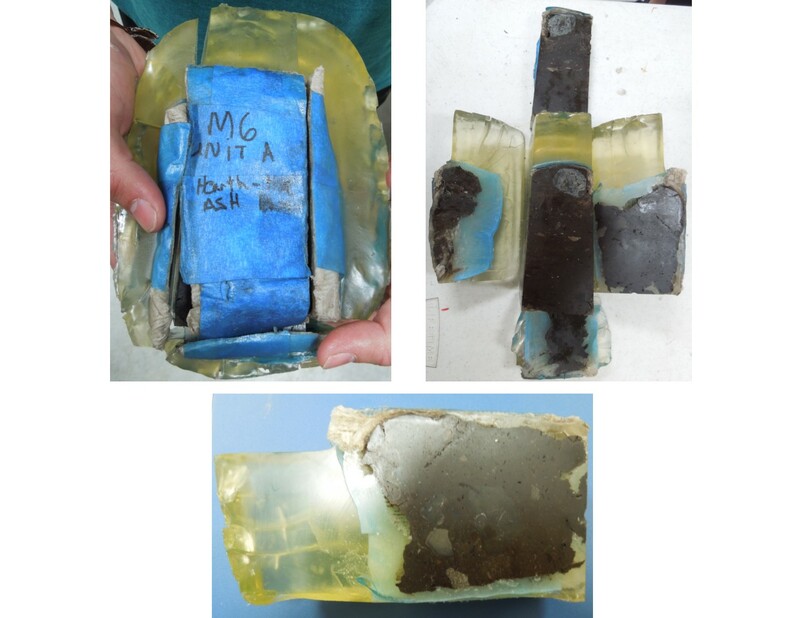 Depending on where an artifact is recovered from can drastically change the archaeological interpretation of that artifact–much like in Hollywood. Images from Google. 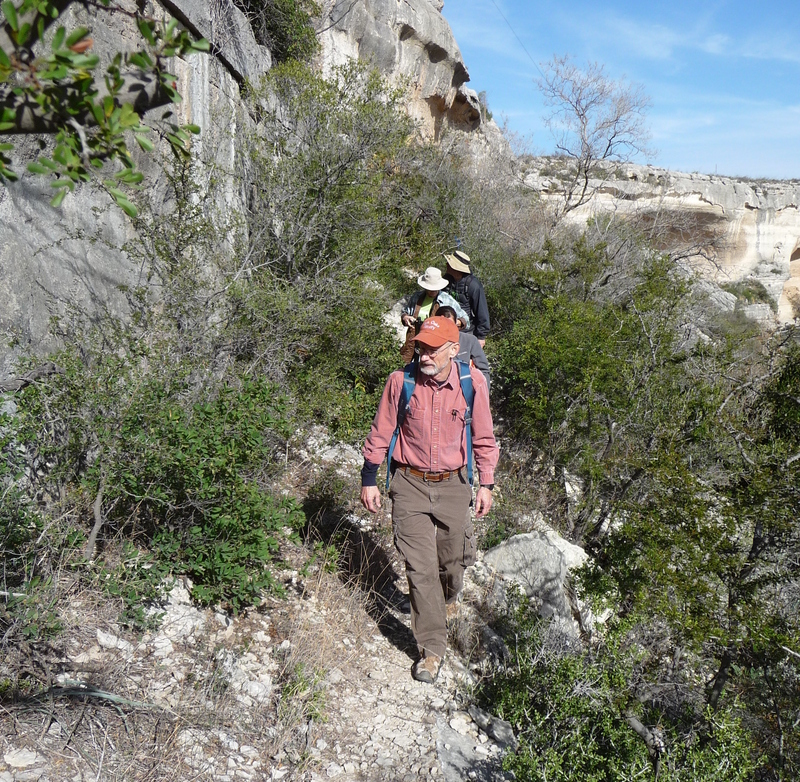 As archaeological methodologies have improved, the ways in which sites are recorded/mapped has drastically changed since the initial investigations at Eagle Cave in the 1930s. 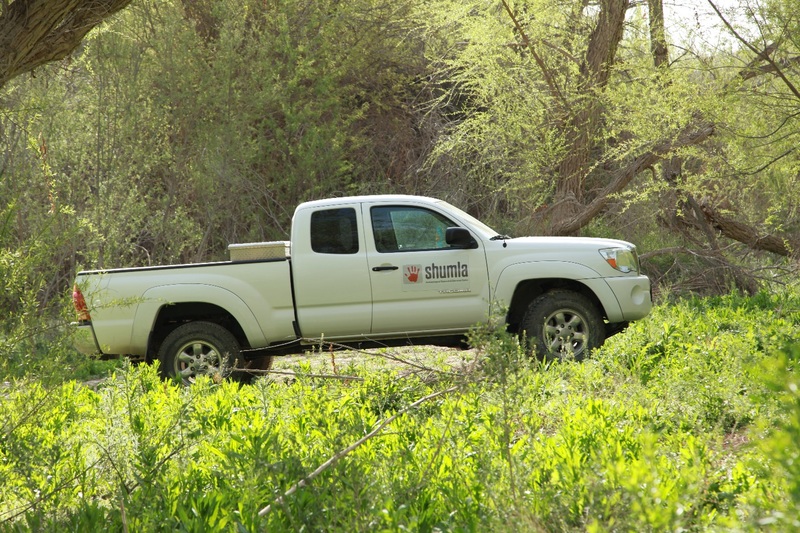 After reading the accounts of our predecessors’ work at the site, we knew the approximate locations where previous work had occurred, but we were unsure as to which areas of the site were still intact. 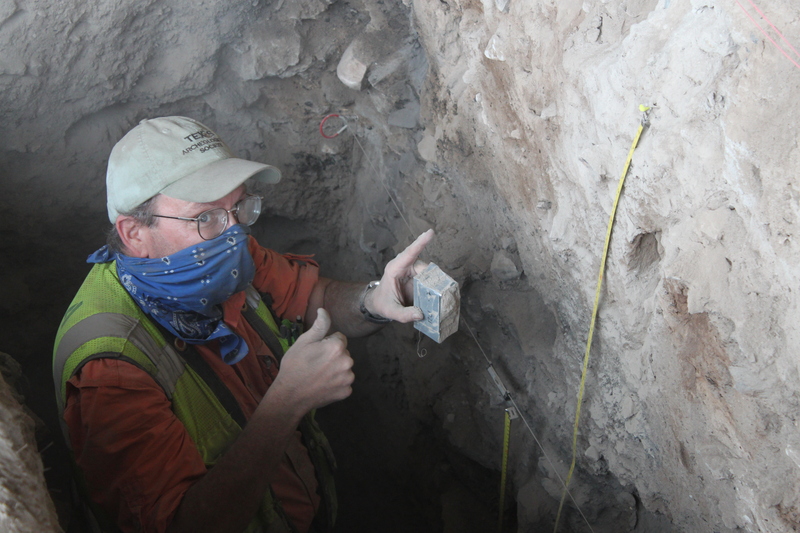 We set out to do so by exposing the vertical profile of a small area near the back wall of the shelter. 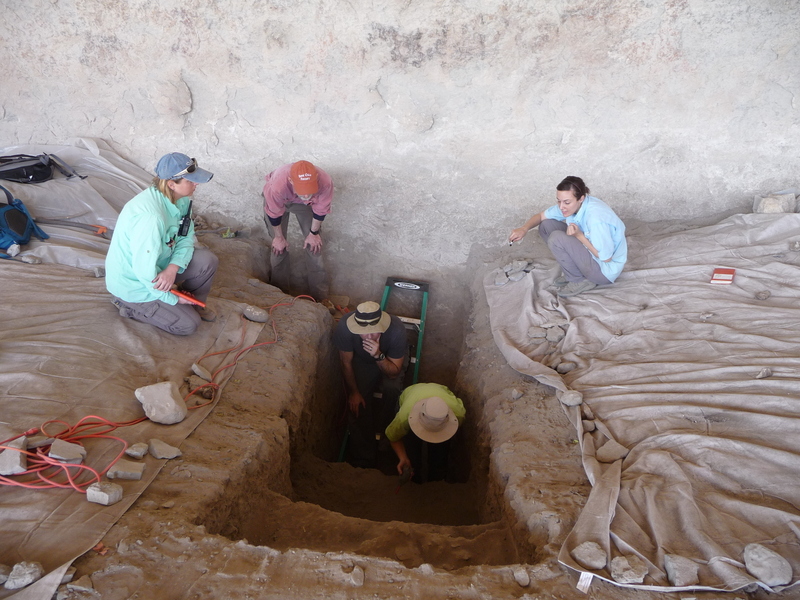 In doing so, we soon discovered much of what we were excavating had previously been exhumed, and was in fact mainly backfilled sediment. 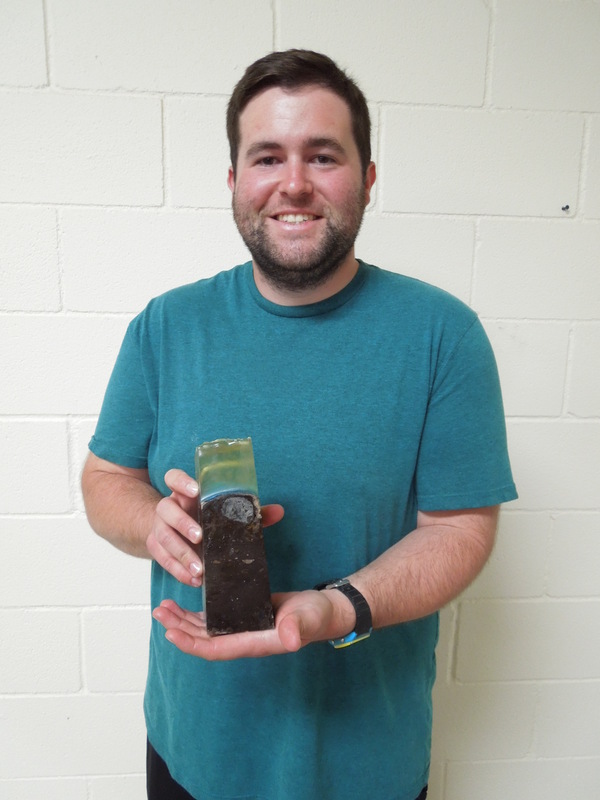 We were able to identify the sediment as backfill because several feet of soil were completely homogenous in color and loaded with sheep and goat pellets. 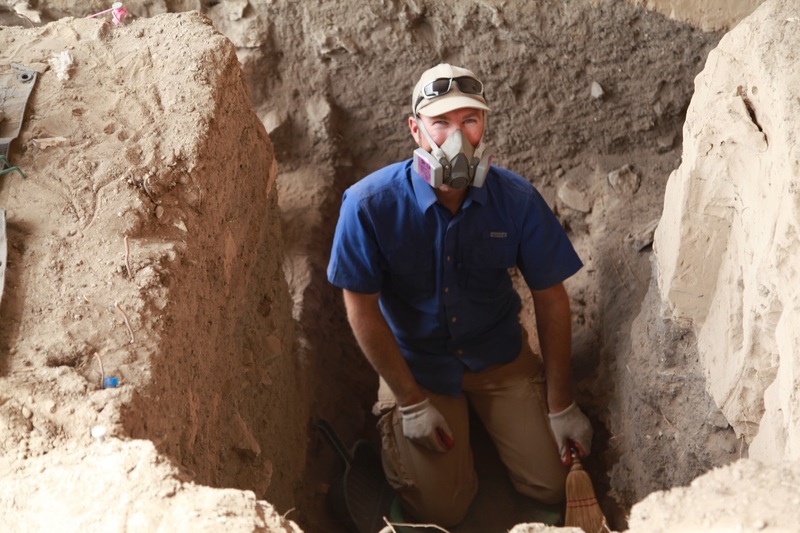 We proceeded to clean more of the profile through the disturbed deposits until we exposed what we believed to be intact/unexcavated strata, and we are now excavating and sampling these intact layers systematically and recording the context where all the samples and artifacts are collected. 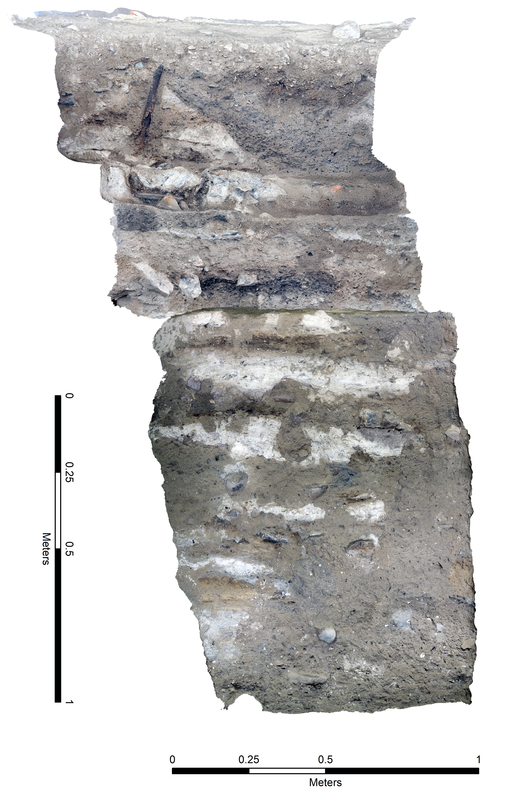 This is a composite image of eastern profile of PS02 showing the intact stratigraphy. 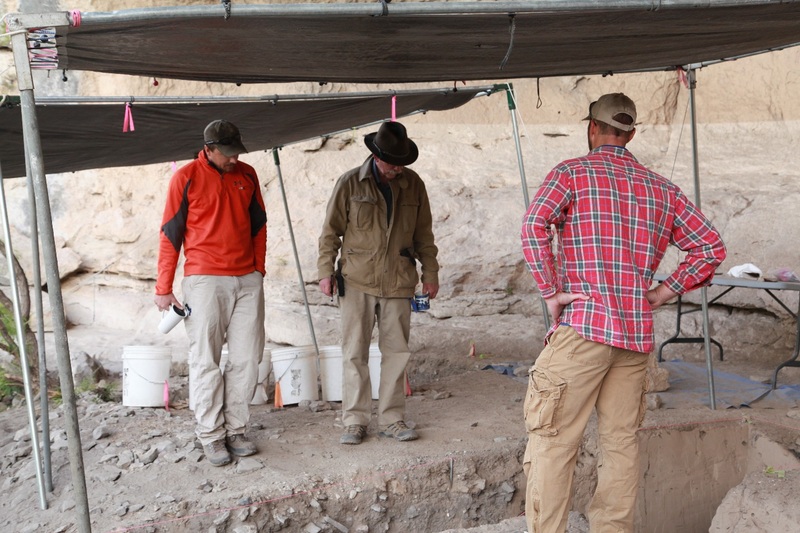 While we were excavating the disturbed fill from the profile we recovered dozens of artifacts—projectile points, flakes, fragments of bone, fiber—but none of these artifacts are in their original context. 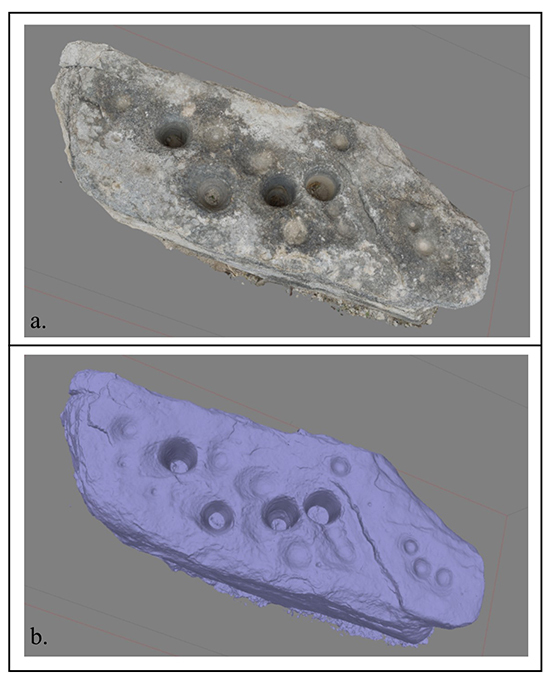 Although some useful data can be collected from the artifacts themselves (e.g., projectile point styles), we cannot learn as much from many objects without knowing their exact archaeological context. 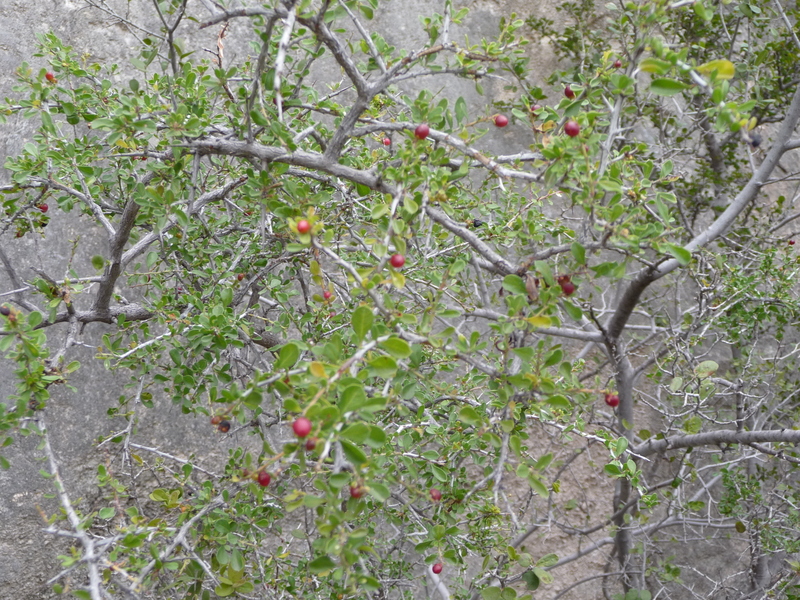 This begs the question of how might we utilize artifacts and ecofacts (e.g., plant remains) with no known provenience? This is a sample of artifacts recovered from disturbed context (from left to right): pebbles with paint, projectile points, bone tool, quid (chewed lechuguilla or sotol leaf), and a fragment of cordage. ASWT has teamed up once again with Shumla, and we are taking some of the material recovered from disturbed contexts and creating an educational collection students can use for hands on activities. Eventually, we hope we can bring these samples to classrooms not only in the Comstock/Del Rio area, but also to San Marcos and beyond. The first group of students to study samples of the materials from disturbed contexts are part of the Shumla Scholars program. The Shumla Scholars is a semester-long program for high school students at Comstock ISD. Students explore research design by examining previous and ongoing projects, and by planning and implementing a project of their own. 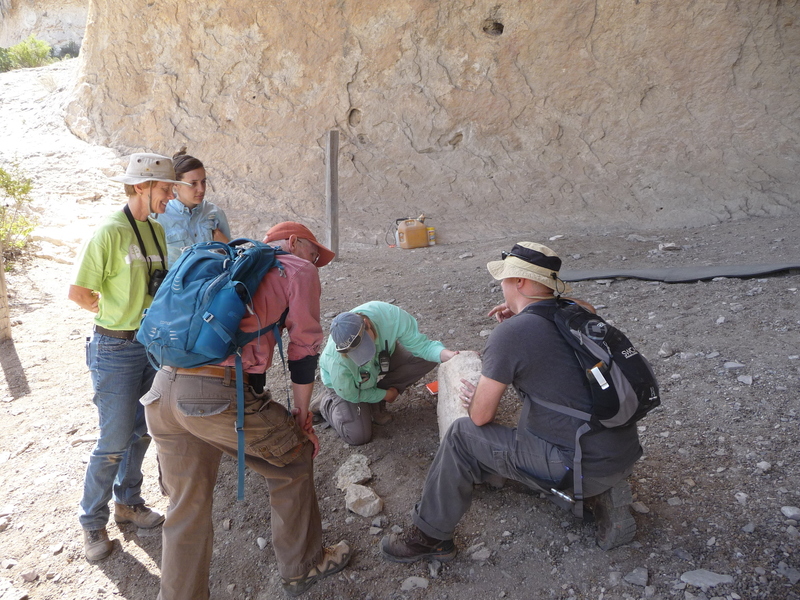 The main objective for the current class is to map and record the Comstock Cemetery, but another part will be to develop hypotheses relating to the artifacts recovered from Eagle Cave. The students will be given several different artifact “packets” collected from disturbed contexts and posed the general questions: what are these artifacts and ecofacts and what can they tell us about the native peoples who occupied Eagle Cave? 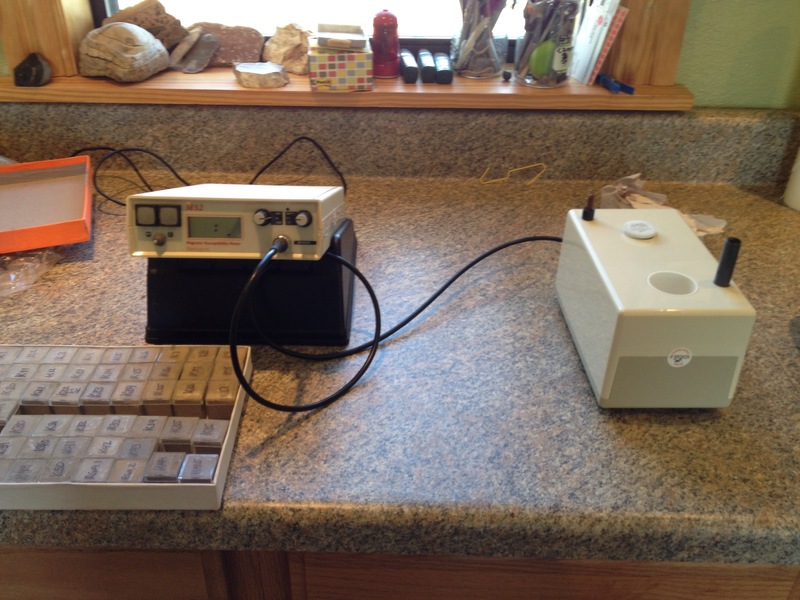 Hands-on experiential learning instead of looking at pictures and drawings. 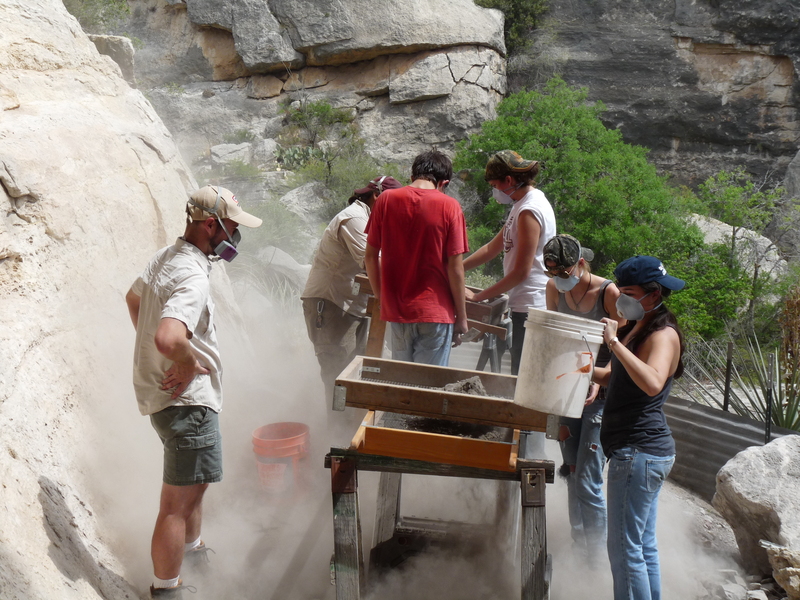 Students from Comstock High School screening disturbed fill at Eagle Cave under the supervision of Vicky Munoz and Jeremy Freeman. These students will be the first to use the artifacts from Eagle Cave in hands-on experiential learning with SHUMLA. We look forward to the Comstock students writing a follow-up blog post about what they learned from the Eagle Cave artifacts! 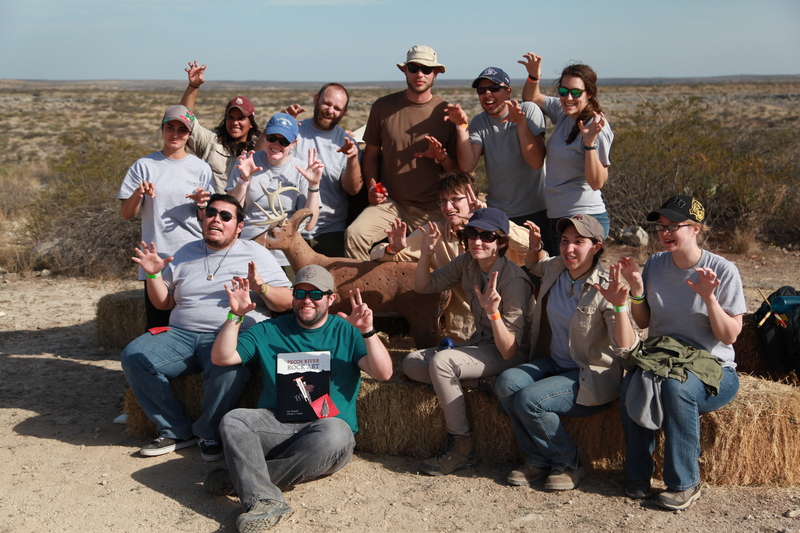 Last Saturday while the world was watching the Winter Olympics in Sochi, the 7th annual Archaeolympics sponsored by Texas Parks and Wildlife, Shumla, The Rock Art Foundation, and the National Park Service was taking place in Seminole Canyon State Park. People young and old came out to watch and attend the games in this all-day event. 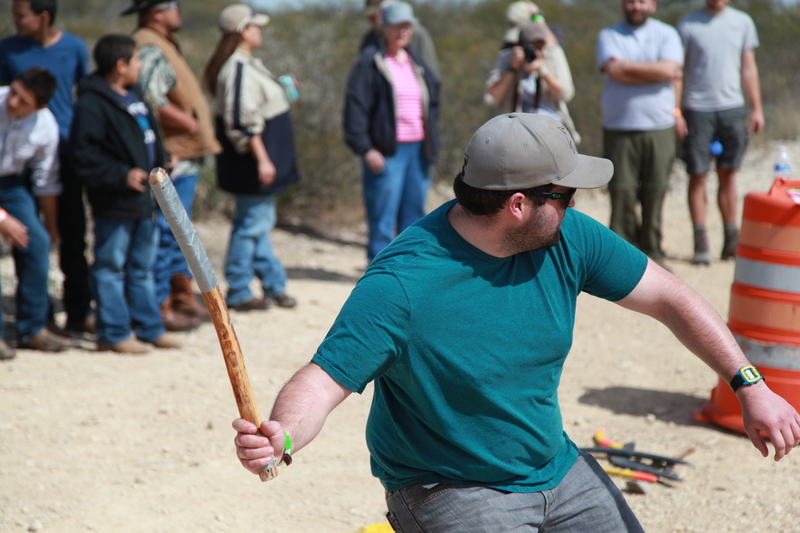 Archaeologists, outdoor enthusiasts, students, and scout troops matched their wits in three competitions: Atlatl, Rabbit Stick, and Friction Fire in hopes to obtain bragging rights for their dexterity, and a chance to win the first place grand prize of a replica Pedernales projectile point. The first competition to take place on Saturday morning was the Rabbit Stick. 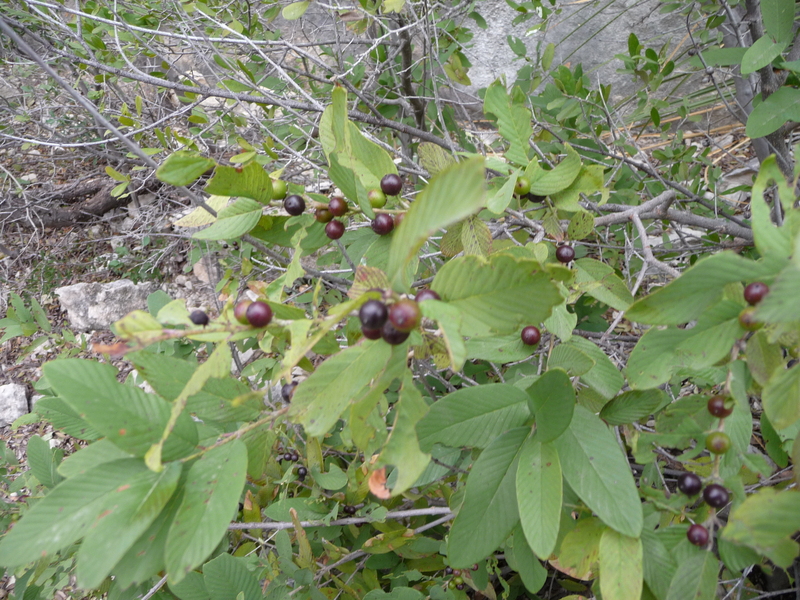 Rabbit sticks are considered a non-return boomerang, and were used by people in the Lower Pecos region for thousands of years for hunting small game. Contestants had three chances to throw a rabbit stick at two strategically placed soccer balls in attempt to knock them off their mounts. Some contenders did great, and others missed all three shots completely. Overall, it was a great warm-up for the next two events. The friction fire was the second competitive event on Saturday. 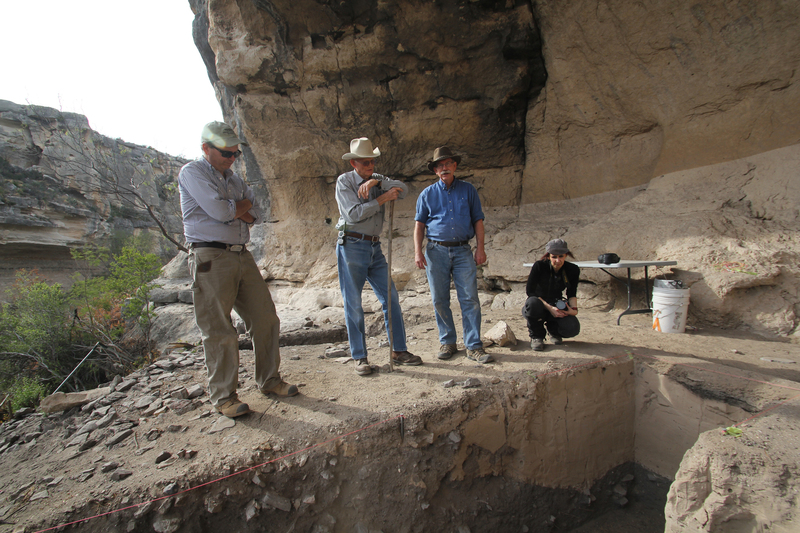 Archaeologists working in the Lower Pecos have recovered numerous friction fire spindles and hearth boards from the dry rock shelters. Charles Koenig, Jack Johnson (N.P.S. Archaeologist), Jerod Roberts (President of the Texas State Experimental Archaeology club), myself, and Texas Archeological Society member Robin Matthews, faced off in a race to see who could be the first to create a flame using just two sticks. As soon as the announcer shouted go, the five of us quickly grabbed our spindles and began to rub our hands rapidly back and forth in a downward motion to get the friction we needed to create an ember. Once the ember began to smoke, we gently dropped it into a bundle of dry tinder and began to blow softly on it until the tinder caught fire. Charles took home first place, as well as a few hand blisters, with an impressive 46 second friction fire. The last competition of the day was the atlatl throw. The atlatl—or spearthrower—was a predecessor to the bow and arrow, and was used by hunters in the Lower Pecos until around 1000 years ago to kill deer and other large animals. An atlatl is pretty simple, consisting of about a 2-foot long piece of wood with a “spur” attached to its distal end (the spur serves a similar purpose as a nock on an arrow string). The dart (or spear) fits onto the spur, and then the atlatl is used to propel the dart with much more velocity than you could throw by hand. 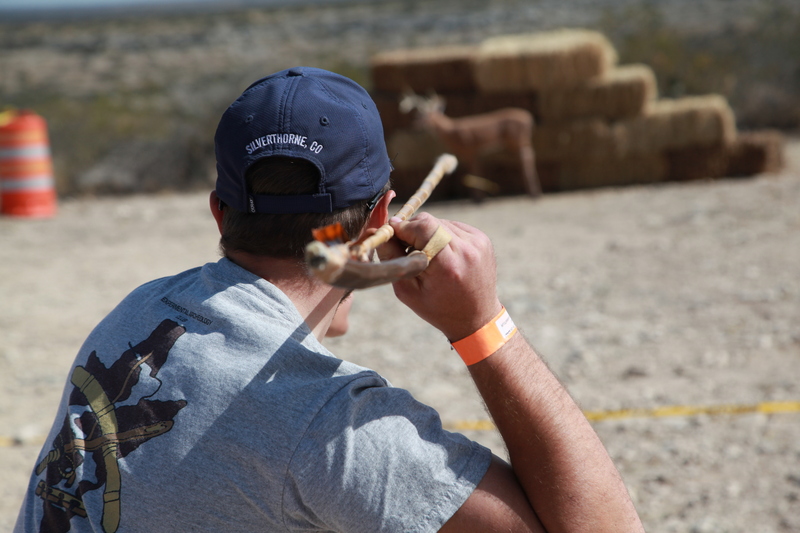 For this competition, contenders threw spears at a 3D foam deer target. Points were based on the area of the deer that spear hit. After several long and intense atlatl rounds, Charles once again reigned champion of the atlatl throw. After the games were complete, awards were presented to the winners and people slowly began to head home. 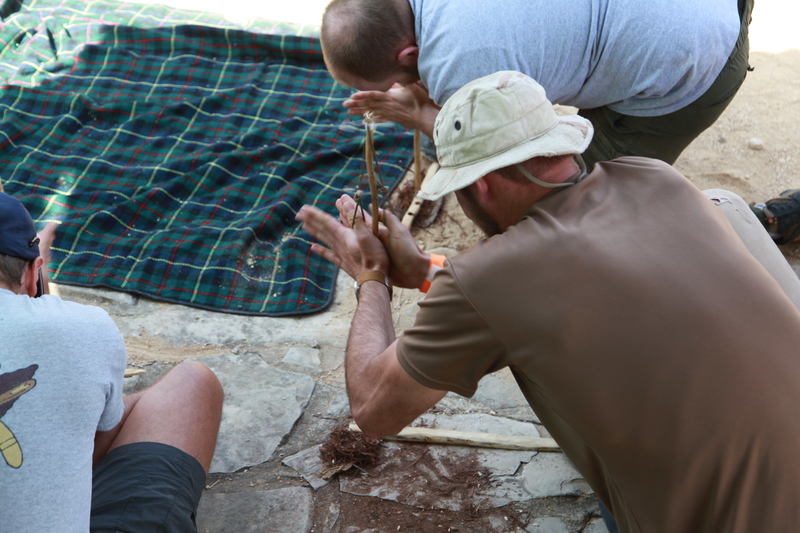 ASWT was happy to take part in the Archaeolympics, and we are are looking forward to next year’s event!